I got back from vacation today and received an email from another victim of the Private Sewer and Water Corporation. It contained a screenshot of Ron's latest post to his Facebook page. It seems that Ron is a little upset that I've publicized his business practices. He only has himself to blame. I paid him upfront for a job that he continually blew off. He's admitted to taking money for a job he didn't do, and done everything in his power to not pay it back. And yet somehow this upsets him. Lets analyze his comments a few lines at a time. 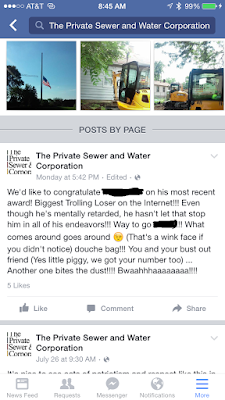 We'd like to congratulate [Private Sewer Blogger] on his most recent award! Biggest Trolling Loser on the Internet!!! Even though he's mentally retarded, he hasn't let that stop him in all of his endeavors!!! Way to go [Private Sewer Blogger]!!! You can tell he knows he's in the wrong because he just jumps to calling people names like a kid in middle school. I also don't think he used enough exclamation points. What comes around goes around 😉 (That's a wink face if you didn't notice) douche bag!!! Not really sure what he means here. This is kind of the whole point of this blog. What comes around goes around. There are repercussions for your actions. You steal people's money and take advantage of them, then that information might get publicized. If that makes you unhappy then perhaps you should try not lying and stealing. You could finish a job when you say you will. You could not take payment for things you haven't done. You know, average decent human being type behavior. And I did notice that was a wink face. I'm not sure what that changes. Is he hitting on me now? Do wink faces have some other hidden meaning that I'm not aware of? He seems really proud of the wink face. Maybe he just learned how to use emoji. And then we're back to the name calling. Apparently giving Ron money and expecting him to do the job he promised to do in under a year's time makes me the bad guy. You and your bust out friend (Yes little piggy, we got your number too) ... Another one bites the dust!!!! Bwaahhhaaaaaaaa!!!! And more name calling. Because Ron Janis is nothing if not classy. I'm assuming the bust out friend reference is to the bounced check that he cashed prematurely. That's an amusing choice of insults seeing as all indications I've seen have him not being able to make payments on anything. And then he goes off the deep end and starts threatening people. Another one bites the dust? What does that even mean? Are we in some sport that I don't know about and he thinks he just won another round? Scumbag contractor 1 - Paying customer 0? In what world is any businessman trying to defeat his customers? And he actually typed out an evil laugh? Seriously? And more exclamation points, because who doesn't love exclamation points? Hey Ron, since you are apparently reading this now, feel free to post your side of the story, or correct any inaccuracies. I'd love to hear about the mental gymnastics that you have to do in order to convince yourself that you haven't wronged me and the countless others whose complaints I've found or had forwarded to me.